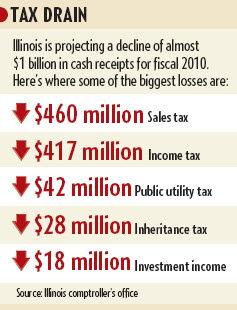 As Illinois’ fiscal crisis deepens, the word “bankruptcy” is creeping more and more into the public discourse. “We would like all the stakeholders of Illinois to recognize how close the state is to bankruptcy or insolvency,” says Laurence Msall, president of the Civic Federation, a fiscal watchdog in Chicago. “Bankruptcy is the reality that looms out there,” Republican gubernatorial candidate Andrew McKenna Jr. says. While it appears unlikely or even impossible for a state to hide out from creditors in Bankruptcy Court, Illinois appears to meet classic definitions of insolvency: Its liabilities far exceed its assets, and it’s not generating enough cash to pay its bills. Private companies in similar circumstances often shut down or file for bankruptcy protection. While Illinois doesn’t have the option of shutting its doors or shedding debts in a bankruptcy reorganization, it seems powerless to avert the practical equivalent. Despite a budget shortfall estimated to be as high as $5.7 billion, state officials haven’t shown the political will to either raise taxes or cut spending sufficiently to close the gap. “The crisis will come when you see state institutions shutting down because they can’t pay their employees,” says David Merriman, head of the economics department at the University of Illinois at Chicago. “I don’t see any light at the end of the tunnel,” says Dan Strick, CEO of SouthStar Services, a Chicago Heights non-profit that helps people with developmental disabilities. “It seems to be getting worse and worse, and the delays longer and longer.” SouthStar hasn’t been paid since July, forcing him to borrow to keep afloat. While new spending is down nearly 2% in the six months ended in December, the state started the fiscal year $3.9 billion in the hole from the previous year’s unpaid bills, which means actual spending was up 2.2%, according to the Illinois comptroller’s most recent report. The resulting $5.1-billion backlog of unpaid bills doesn’t include $1.4 billion in Medicaid and group health bills that haven’t been processed, plus $2.25 billion in short-term borrowing that must be repaid soon. The state’s credit rating has been steadily worsening since 1997, with three downgrades in the past 13 months. “The absence of recurring solutions in the next year to deal with the current budget challenges and begin to stabilize liquidity will likely result in a further downgrade of Illinois,” Standard & Poor’s said last month. The real fear is that the state could eventually be unable to plug its budget gaps with short-term borrowing. Illinois is still a long way from Arkansas during the Great Depression, believed to be the only instance in the past century when a state defaulted on its debt. But California was forced to seek a federal guarantee for its borrowing last year when credit dried up. It didn’t get the guarantee, and state officials are now seeking a $6.9-billion federal bailout. While California has an even bigger budget hole to fill, Illinois ranks dead last among the states in terms of negative net worth compared with total expenditures. The state’s liabilities, including future pension payments, exceed its unrestricted assets by $39 billion, more than 72% of its total expenditures as of mid-2008, according to Richard Ciccarone, managing director and chief research officer at McDonnell Investment Management LLC, an Oak Brook money manager that invests in bonds. “It’s probably higher now,” he adds.